Is your kiddo ready for an amazing and magical underwater adventure this Halloween? She might think so, but she won’t be ready until you grab her this beautiful Mermaid Costume for children. She’ll look as if she transformed into one of the lovely daughters of Neptune, god of the sea. Once your little girl throws on this enchanting outfit she’ll be ready for a truly memorable Halloween. She’ll be the cutest creature running around the block collecting treats this year. Many other children may choose to be supernatural creatures like vampires, werewolves, and zombies, but your kiddo will stand out with this adorable outfit. However, lore about this mythical creature luring lonely sailors to their dooms has been around for centuries. Sure they’ve been reimagined as pretty princesses of the sea, but it can be up to your little one which version of this legendary aquatic creature she’ll be. Either way, she decides to play the role, with this lovely Mermaid Costume for girls, she’ll surely be the cutest mythological creature in your town this Halloween. Grab her a few accessories to complete her transformation. A seaweed boa to wear around her neck would compliment her new look perfectly. Also get your hands on some seashell jewelry and add a bit a razzle-dazzle to your kiddo’s costume. Lastly, a wig of long luscious hair will be the cherry on top of this magical outfit. 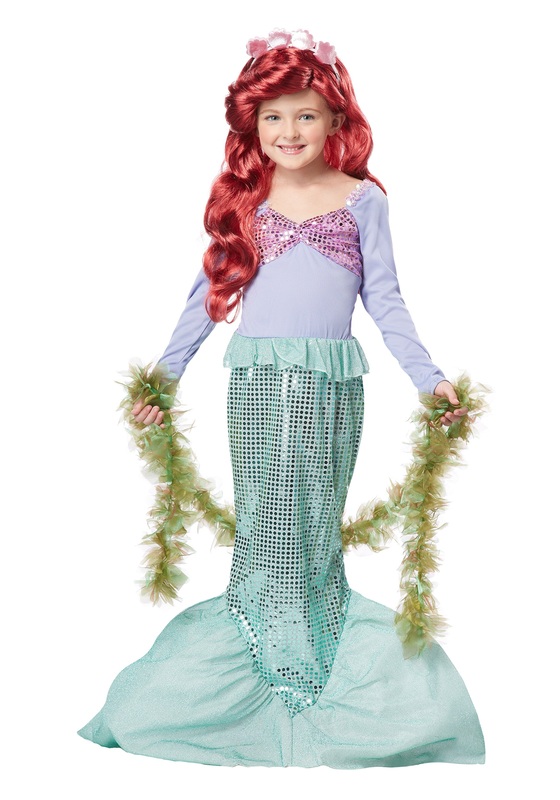 Give your little girl a magical experience this Halloween with this Child Mermaid Costume and be ready to capture photos of your smiling siren!